It’s a bit like living in a fairy tale, and it happens every day here at Indraloka. We are all one big family, and the cats of Indraloka are a big part of what makes this such a special place. Nearly 100 cats currently call Indraloka home. Pastures stretched before us, warm winter gold against a periwinkle sky, while a rainbow arced breathlessly end to end across the grounds. Our visitors were receiving an enthusiastic welcome from Vanna, a playful geriatric goat; Selick, a charming and affable blind pig; several gregarious turkeys; and around a dozen inquisitive cats. The menagerie vied gently for the bemused visitors’ attention, without once jostling one another out of the way. Just then, a group of ducks noisily parted our crowd, intent on a game whose rules or name none of us knew. But none of the other animals even flinched, they just calmly stepped out of the way. It’s a bit like living in a fairy tale, and it happens every day here at Indraloka. We are all one big family, and the cats of Indraloka are a big part of what makes this such a special place. Nearly 100 cats currently call Indraloka home. Many of these were former ferals or strays who found their way to us and never left; others came from shelters or were even abandoned here by people who didn’t want them anymore. But regardless of how they arrived, these kitties have made an amazing family for themselves— and for us. While all of the cats at Indraloka are uniquely special in their own right, many have also come to perform an incredibly special service for the farmed animals we rescue, who often arrive confused, afraid, and deeply traumatized. But inevitably, one of our friendly felines adopts each struggling newcomer and provides much-needed love, reassurance, healing and companionship. 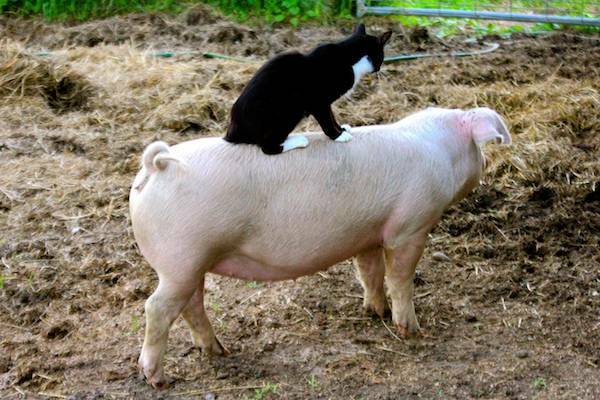 These special interspecies friendships persist for as long as the animals are with us. Wesley T. Monkey is an irresistible extrovert with a BIG personality. Most of the cats here have a few good friends, some feline, some of other species. But Wesley T. Monkey has LOTS of good friends of every species. He is just that popular. While many of our cats have no compunction about jumping onto the lap, or even shoulders, of visitors, Wesley T. Monkey doesn’t stop there! 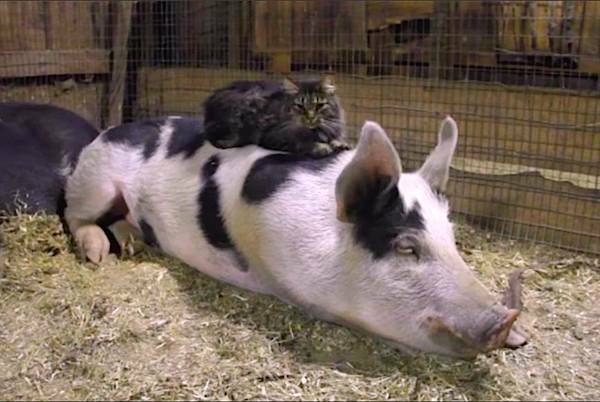 On a daily basis, Wesley can be spotted riding a sheep or a pig, sunbathing on top of a dozing cow, or even sleeping curled up against a chicken friend. Wesley is ridiculously wonderful in many, many ways. 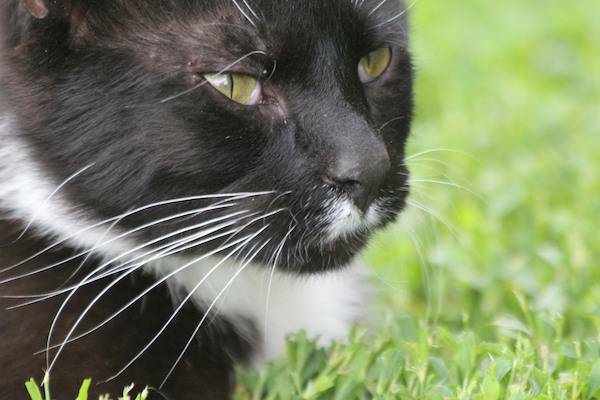 Like so many cats, Wesley knows instinctively when someone is in need, and he does not shy away from their suffering. 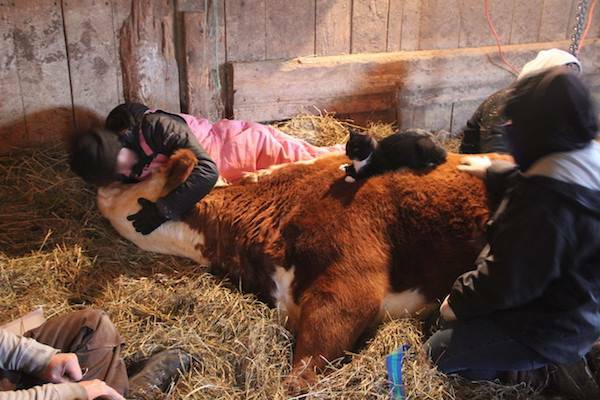 Penny the cow was the beloved Grand Dame of the sanctuary, a mother and friend to all. Wesley and Penny spent many happy hours together, Wesley contentedly grooming himself while Penny grazed nearby. But Penny was more than 30 years old, and the day came when she could no longer stand on her own. As she lay dying, surrounded by friends, Wesley climbed up and lay right on top of her for her final moments, helping her to feel loved until her last breath. Babaji was born to a stray cat who showed up pregnant at our sanctuary. 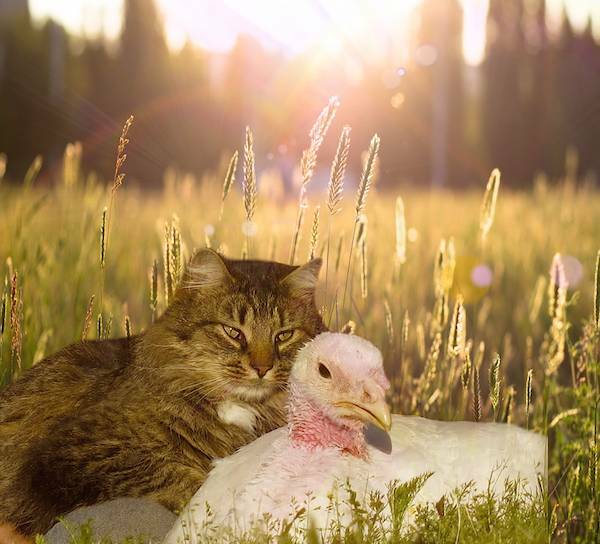 Early on, Baba cultivated a special bond with Louise the turkey, who was rescued from slaughter and who arrived afraid and in need of a friend. Many have observed these two relaxing in the sunshine together, curled up to sleep in the barn at night, or even out walking and exploring the sanctuary side by side. Baba’s other favorite friend? Jeremiah the pig, a “backyard meat” victim who arrived to us completely skin and bones, unable to walk and bleeding profusely from the nose in the final stages of severe pneumonia. But with extensive veterinary treatment and nonstop TLC from his two-legged and four-legged friends, Jeremiah survived and now thrives at Indraloka. Babaji could not be more pleased with this outcome.